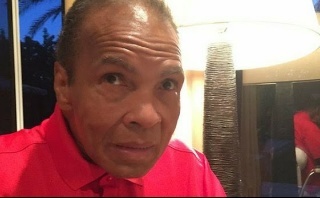 The legendary boxer posted this pic of himself on Instagram yesterday, looking a little frail but in good health after two recent visits to the hospital for pneumonia. Muhammad Ali posted the photo and wrote “So proud of @thereallailaali, my baby girl. First female boxing analyst making her debut tonight on NBC’s Premier Boxing Champions”.